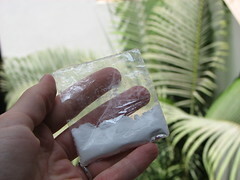 KimmyKokonut » Blog Archive » Baking soda…or covert cocaine operation? « A few meals at home. Baking soda…or covert cocaine operation? I don’t really appreciate how nice it is to have your very own kitchen and a well-stocked pantry until I am in a foreign country with an empty kitchen and very little inspiration to cook. I smuggled “Vegan with a Vengeance” with me to Peru, hoping it would provide some sort of light in a tunnel full of meat and dairy (although I’ve been eating really well on the coast..it may help that I’m volunteering at a vegetarian restaurant). (FYI: Did you know that Peru imports beef from Argentina? They can’t “grow” enough for the demand in this country.) I have been able to find many ingredients I would have thought difficult: soy milk, flax seeds, soya de carne (which looks just like dog food and tastes like wet bread). But the one ingredient that really makes vegan baking possible is baking soda. And that has been my drama. Peru is not known for their chocolate, it is more like Hershey’; and I, after 23 years of snubbing all chocolate, will only eat enjoy the dark, bitter chocolate (70%+), like Dagoba. Desserts here tend to have a lot of sugar, butter and eggs. While craving chocolate and an alternative to the desserts available in the store, I came across Isa’s Banana Pudding Brownies and my mouth started watering. 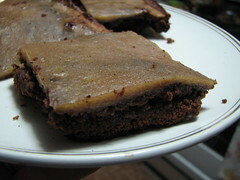 I’m not much of a cake person, but gooey fudgey brownies will make my day, any day. So, for the past week I have been collecting ingredients. I have found chocolate, cocoa, sugar (the main sugar here is raw unbleached sugar cane: Yay!). But the one ingredient that has eluded me is the baking soda. My Spanish dictionary lists the translation as bicarbonato de soda. I asked at bodegas; I asked at the restaurant I work at. Everyone said to go to Trujillo. At work they suggested I use polvo de hornear (baking powder)…but my research suggests it is NOT a valid substitute. Baking soda is 4x as strong as the powder, but they are not equal. You can try, but it won’t behave the same. Apparently you can substitute baking soda for baking powder (1 tsp baking powder=1/4 tsp baking soda+1/2 tsp cream of tartar). It won’t work the other way around because the powder contains acid to neutralize it. Normally in recipes for baking soda, there is something acidic in the recipe to neutralize the soda (vinegar, lemon juice, chocolate, buttermilk). So after an evening full of drama making lasagna here, I didn’t want a disaster with my brownies. I continued my search, fearing a trip to Trujillo was necessary. I was going to check the pharmacy today (a recommendation by a local) but when I was buying my fruit at the market next door, I found baking powder…and thought, this is good enough, I’ll risk it. Somedays I don’t have the energy to describe and hunt for things in spanish in a spanish-speaking country. At the check-out, I asked the woman if she carried bicarbonato de soda. I had to say it twice, but when she understood me, she sent me to the back of the store, where a woman handed me a bag of white powder that was among the spices, beans and chicken feet.